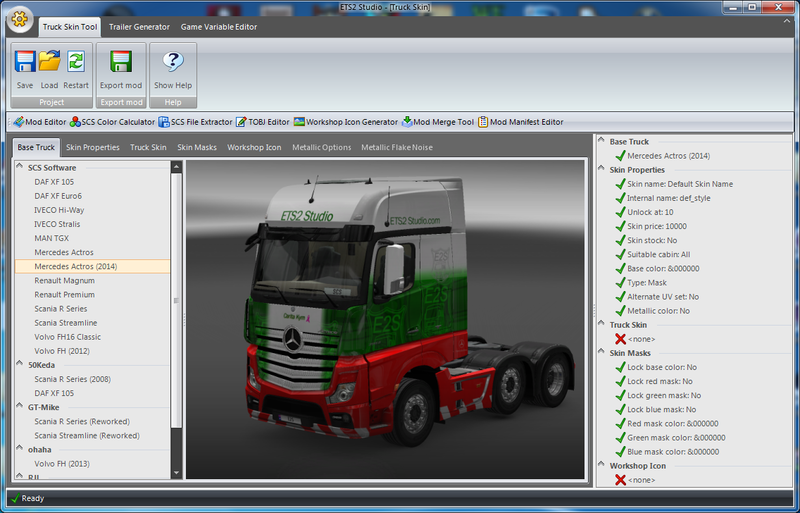 Create truck skins with a couple of clicks! 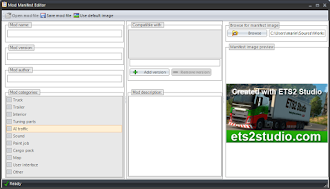 You can use plain PNG files that you can make in any image editor. Almost all advanced skin features are supported including the creation of mask skin types (the ones where you can change colors in game). 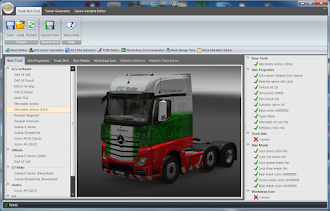 Create your own standalone trailers for ETS2 with your own skins and cargo! 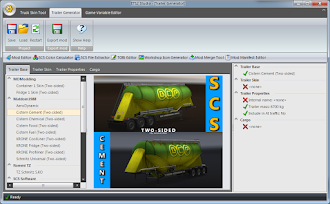 ETS2 Studio offers a wide selection of trailers: Classic 'vanilla' trailers created by SCS Software, double-sided trailers created by MDModding, and some popular mod trailers like the Flemming V. tandem trailers. You can create your own cargo for them, or use provided standard cargo from the game. Ever wanted to change some parameters in the game? Here's a fast and easy way to do so. Main sections that can be changed are: Economy, Bank, Enviroment and Police. 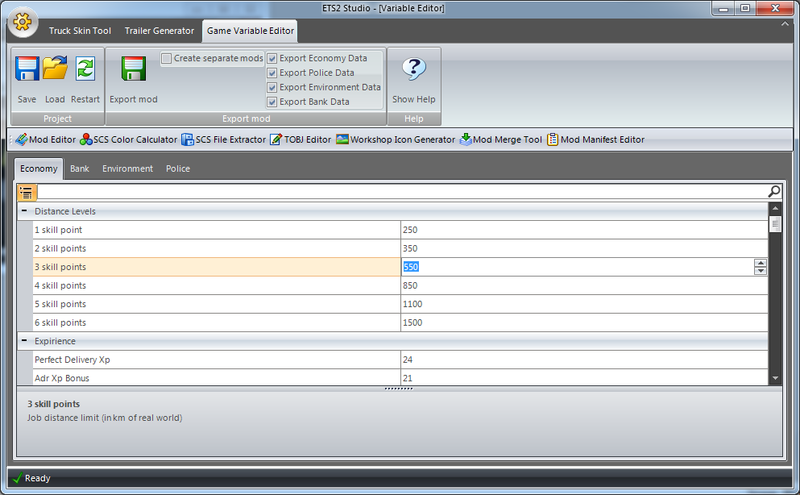 Variable editor also comes with descriptions of commonly used variables, so you'll know what to change. Mod Editor lets you open scs mod files with a single click, and edit all definition files in them (SII files). It provides a syntax highliting so you can easily see if everything is correct. The best part is, that you can simply save the mod file without the need to re-pack the edited definition files int the mod archive. 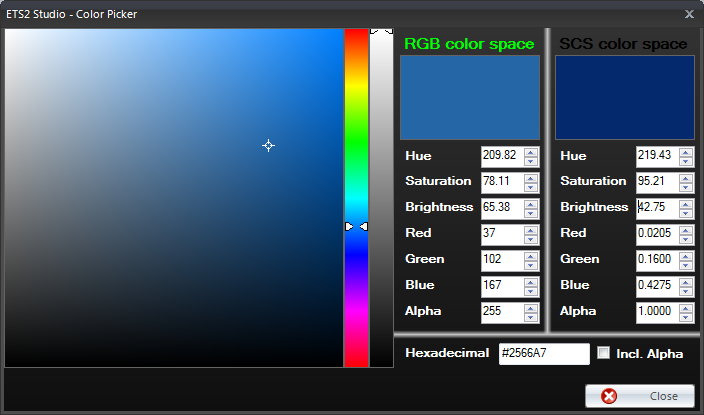 Color Picker and calculator let's you select a color and convert it from SCS color space into RGB color space. 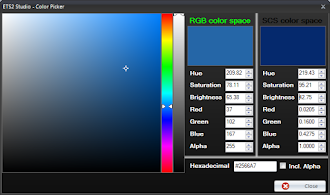 It offers all the possible options you could need for converting colors. Many are uncomfortable with using command line programs. Heck, even some of us are. And, let's face it: it's 2016. That's why we came up with a pretty interface for the SCS's own extractor. 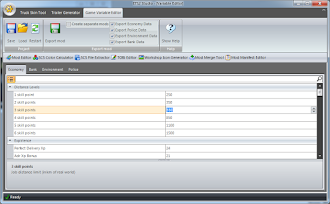 The easiest way to edit TOBJ files. Open up your existing file and change the path. All the calculation and magic behind it is done by us. Create icons for your accessories or paintjobs, quickly and easy. Use a plain PNG image or a DDS one, doesn't matter. We'll pack it up so you can easily include it in your mod. Yes, we do create all the folders and files that go with the icon. You want to easily merge smaller mods into one bigger? No problem! Just select them and click a button! 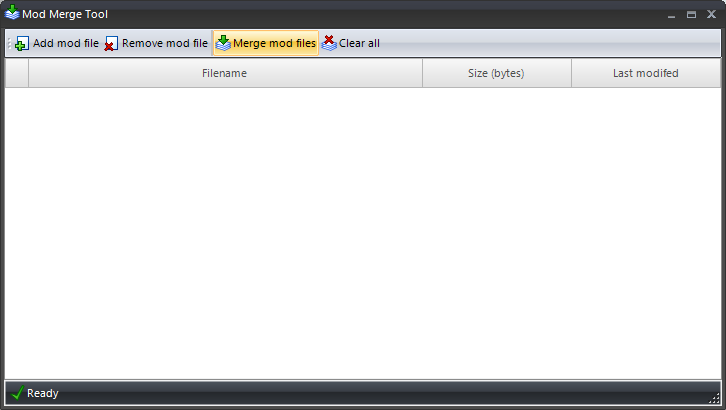 Our tool will take them one by one and merge them into one big mod. Also, you can select different options how to handle merge conflicts. 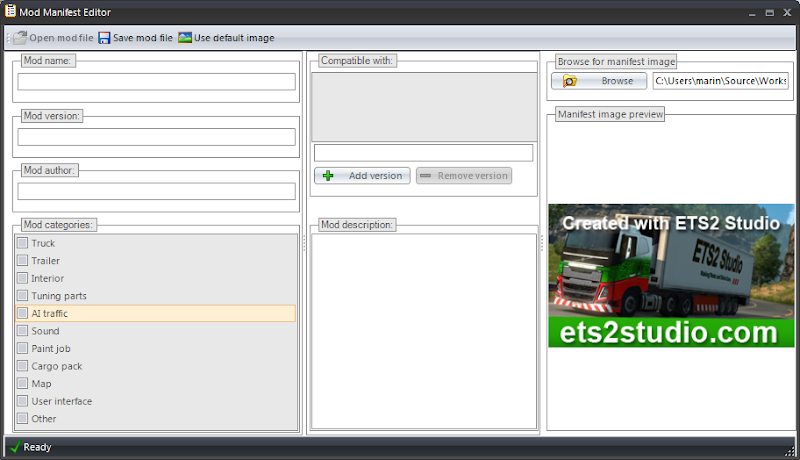 Easily create mod manifests that are used by SCS's in game mod manager. 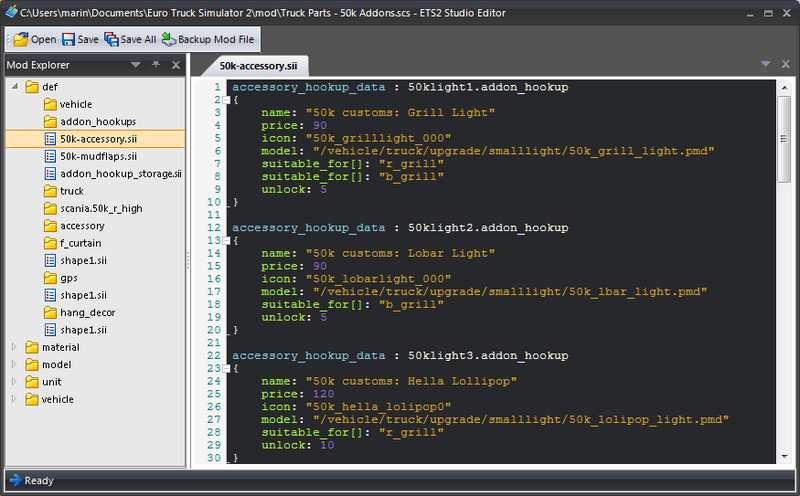 Open the mod, enter the details and click save. It's really that easy. We really are a cool little group of code monkeys. If you like programming, you'll fit right in! No matter what level of expertise you have. We alredy posted a great blog post about this that was written by Cadde over two years ago. It's still pretty much the same... so, feel free to take a look. Help us pay for the costs and maybe even a cup of coffee! We dedicate hundreds of hours towards the Mods Studio project. A couple of times, we even declined payed work so ETS2 Studio development would go on. Also, we cover all the hosting costs and domain name registration costs from our pockets. We really appreciate each and every donation, since it enables us to work on the project we all love and care about! A way to clean your Steam inventory and help at the same time! We can make good use of all the items that can be found in your Steam inventory. And, game gifts can be super useful as prizes in our contests!